Asian Americans have a unique voice to contribute to the academy and yet, in the field of Christian ethics, there has not been Asian American voices or scholarship taking place specifically dealing with Asian American experiences. For the first time, Grace Y. Kao and Ilsup Ahn compiled a book addressing Asian American ethics, bringing Asian American voices, methods, and issues to the academy. By doing so, they are also introducing a new subfield called Asian American Christian ethics. Asian American Christian Ethics: Voices, Methods, Issues is an important project, as Asian Americans bring different perspective to the academy. We need to take seriously cultural particularities when doing ethics, especially in a culturally and racially diverse world in which we live. 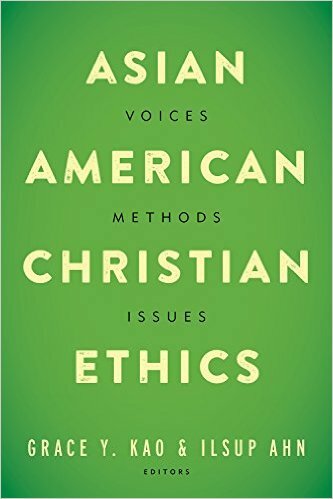 This book addresses important issues in Christian ethics by looking at three categories: general Christian ethical issues, social justice issues, and special interest issues. While each chapter presents the Asian American perspective, building on the thoughts of their Asian American counterparts in different fields such as Bible and Theology, the authors also reference classical sources with which they dialogue. The first task, however, was to determine the foundational aspects of who Asian Americans are and their methodology. Though we are seen as a monolithic group to the West, Asian Americans are unique in the myriad of languages, cultures, and immigration experiences we have experienced. While it does attempt to speak on behalf of Asian Americans, it also address the very real differences between Asian Americans who come from different parts of Asia. This meant that Kao and Ahn must define Asian Americans. The editors provided their concept of an Asian American that includes any persons having origins in any part of “the Far East, Southeast Asia, or the Indian subcontinent.”1 This definition excludes several parts of Asia, including Central Asia, Western Asia, the Middle East, Russia, and the Pacific Islands. Further, for the work to qualify as Asian American Christian ethics, the work must carry an intentional identification of Asian American as a political entity based on social activist origins. Their hope is to bring about an agency/advocacy centered dialogue that also brings together the western and eastern ideas for a critical dialogue. The editors are aware that this book, as the very first volume, cannot encapsulate everything. Instead, the authors hope that their readers will become engaged in the ongoing dialogue of the discussions presented in the chapters and contribute their thoughts to this nascent subfield. To facilitate this, each chapter includes questions for reflections and discussion, which provides a starting point for all readers, especially those who are teachers and students to delve more deeply into the materials presented. While there are certainly topics of interest to the dominant dialogue, these chapter, especially those in the special interests section, adds nuances to the greater conversation that includes the struggle of Asian Americans. Colonialism and white supremacy and sexism presents differently in Asia American. This book not only brings about differences with other groups, but also shed light on the similarities of Asian American voices to the voices of other minorities as well. Ethics is not a field steeped only in theory; it has very real applications that can impact people’s lives. This book provides a solid start for a more multi-dimensional ethics that is more understanding of the differences of Asian Americans to bring about better understanding.